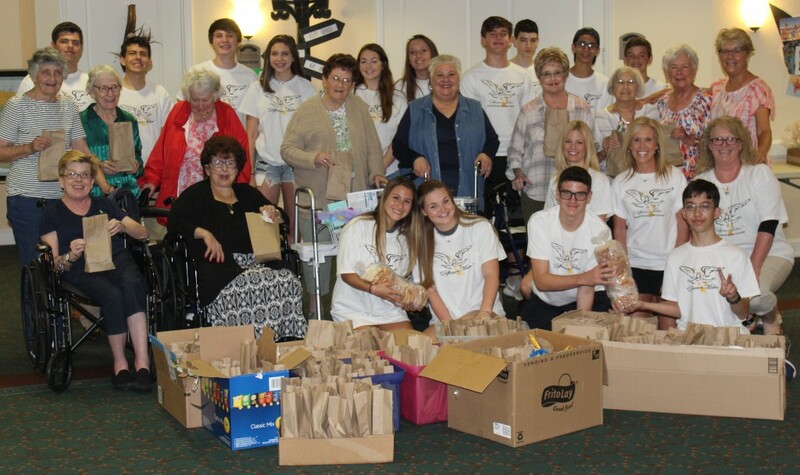 Residents at The Bridges Assisted Living Community and teenagers with the Brandon Foundation’s Junior Angel program worked side by side recently to make 200 peanut butter and jelly sandwiches to feed the homeless. The sandwiches, along with fruit snacks and chips, were bagged and delivered to St. Francis of Assisi Catholic Church in Seffner that supports the Hillsborough County Homeless Initiative. “Bringing together the assisted living residents and the Junior Angels was terrific for everyone. It was wonderful to watch them work side by side and help each other make the sandwiches while talking, laughing and getting to know each other,” states Jill Lansky, Chair of the Brandon Foundation Junior Angel Program and mom to Noah who is a Junior Angel. According to assisted living resident Margie Ploor, “Working with these kids for the purpose of feeding the homeless was so rewarding and it warmed my heart.” Both groups are committed to continuing their partnership to support those in need.